Welcome to CTA Automotive Consulting's internet store. CTA Motorsports provides an array of performance automotive parts for domestic and import vehicles. Though many parts may not be shown, you may contact us for more parts information. We specialize in providing the highest quality performance parts available for your vehicle. All of our parts are designed to be direct bolt-on installations, some with minimal modification requirements, and provide you with honest and realistic performance gains. Please click on our logo for our Product Line Card. 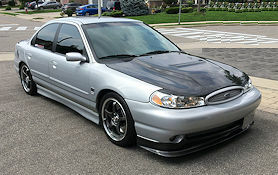 Please click on the logo to view Ford Contour Parts we offer from BAT. Please use this email address if you would like to contact Chris @ CTA Motorsports. Please use this email address for questions about our products or stock availability. Please use this email if you have already placed an order, and you wish to follow up with a status update or any changes made to your existing order. Please reference your Order ID number.